About the time the Market was doing its 1,000 point skydive yesterday morning, I was considering some stuff that Rohr was laying out in one of his devos. I find the parallel and timing sort of weird, but maybe not. The conversation was centered on the philosophy and lifestyle of St. Francis of Assisi. One of the things that I found humorous in Rohr’s ramblings was the thought that the church in America has a sentimental view of what Francis represents. 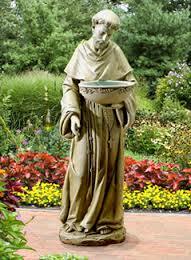 Rohr calls it (this is brilliant): birdbath Franciscanism. Honestly, that is a pretty funny description of how we are about things. Rarely do we get the real depth and meaning of the images we revere. The suggestion is that no one chooses (especially here in America) to live without our comforts and conveniences. Us, embrace, moderation or inconvenience at any level? No frikk’n way! Rohr’s overall point was that Francis ultimately chose freedom and love—not just blatant poverty. Because he chose love, he was free to empty himself so that others could be full. Obviously Francis did make choices. He did turn his back on affluence. Yeah, that had to be tough at some level. He totally identified with the poor and broken. Again, that put him in a minor category. And, Francis chose to be (his words not mine) the “idiot of God.” Wow. Sign me up coach! These are radical ideas, but every now and then we probably need to reassess ourselves again. I don’t feel that we have to take some sort of vow of poverty in order to truly flow in the Kingdom river, but, am I, are we, really free to love at the levels that the Spirit might impress upon us? How secure are we because of what we have? Do we have to possess in order to be settled and happy? Listen, I adore comfort as much as anyone (I’m currently sitting in a family member’s house, on a plush couch, as the AC cools my blubbery body), but there isn’t much testing inside our tents of total comfort. It says little about our internals, our values, or our resolve to stay in peace no matter what… or does it? Do I have the stuff inside of me that births pools of grateful rest and contented peace regardless of the world’s volatile economy? The prophets of our doom are always barking. You can hear them, right? “Be afraid. Yea verily, be very afraid.” Yeah, it’s pretty annoying, but I hope you don’t hear that tone with any of this. Maybe the question isn’t do you embrace minimalism or conservative protection. The greater question is probably, do you embrace God IS love? That is actually deeper than accepting the fact that God loves us. It’s a very different discussion to consider that God IS love. I honestly believe that our paradigms have to shift in our world when we honestly evaluate the thought that: God IS love. Freedom explodes from every direction. Our compulsive attachment to every certitude we possess seems to dissolve on a regular basis. It’s there that we have to submit to how secure we really are—regardless of the free-falls inside of this whacky world we live in. Geronimo! “Consider the ravens, for they neither sow nor reap; they have no storeroom nor barn, and yet God feeds them; how much more valuable you are than the birds!” God with skin. I realize it’s not always convenient or possible to sit down and view a 45 min video. I know that we have been conditioned by media to give-way to our spastic attention span, but sometimes we need to absorb a much needed readjustment. Absorption is a process. It doesn’t happen in an instant. It takes a little time. I don’t know what your default reaction is to life’s storms, but I know mine, or at least how I’ve reacted at most things that are scary and uncomfortable. I have been one to rally the troops for prayer and support when I didn’t like the threat of waves that hovered above the edge of my dingy. I’ll admit, I’ve hollered and squealed with the best of them. Looking back at all that, I can see how hopeless and faithless my flesh has reacted to the negs of life. I had forgotten some very solid truths. Yes, I too need adjustment from time to time. Let me offer a great word to get into your spirit. It’s not mine, but a friend’s. Anth Chapman recently spoke a great word in his home church in York, UK. It is a fabulous reminder about real peace in the midst of real storms. It is something that we all need to take to heart. I hope you’ll find the time to let this word wash over you. It’s a great adjustment to our soggy boat.